At the end of the Second World War, BMW was in dire straits. The Eisenach factory ended up in the Russian sector and East German workers would make pre-war 327s until 1955. Meanwhile, British prewar partner Frazer Nash had snagged BMW engineer Fritz Fiedler at war’s end, and Bristol was building the very BMW-like 400 in England. BMW’s management pondered a Fiat Topolino-sized two-seater, but Kurt Donath the senior executive thought something much better and much grander was needed. 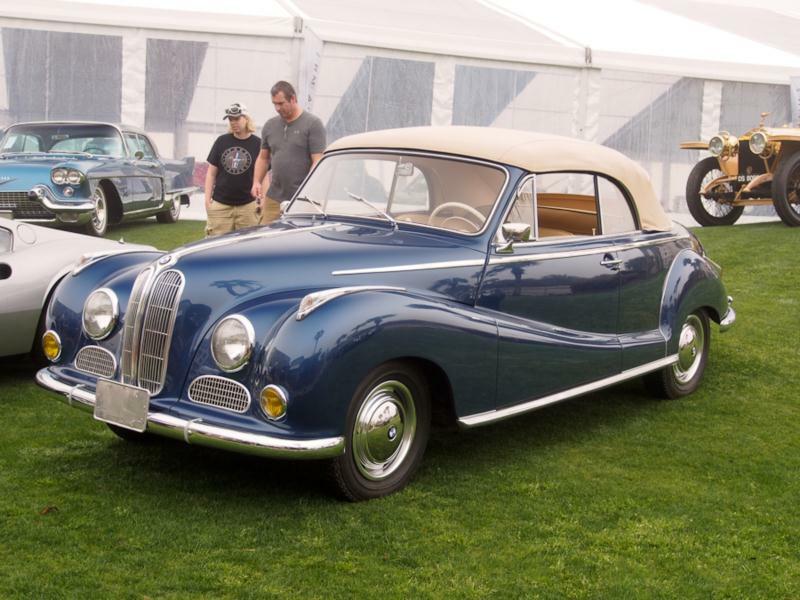 BMW revived a prewar design that was never built, and the sole surviving 332 sedan was reworked as the 541, and then launched at the 1951 Frankfurt Auto show as the new 501. The public was underwhelmed. The “Baroque Angel” was powered by the prewar 326’s 65 bhp, 2-liter six-cylinder engine, but it weighed 2,955 lbs. It also cost a staggering $4,500, half again as much as the Mercedes-Benz 220. It soldiered on until 1958 and 8,951 were built, including a number of handsome Baur cabriolets. 84 mph just wouldn’t do, though, and the solution was an aluminum 95 bhp, 2.6-liter V-8, which was introduced in 1954 and cut 0-60 mph times to 15 seconds and raised the top speed to 110 mph. A further increase to 3.2 liters in 1955 raised power to 120 bhp and 0-60 mph was cut to to 13 seconds. A 502 model had joined the 501, with much more luxurious equipment, though either engine could be ordered. For 1957, BMW added another carburetor, freed up the exhaust and altered the camshaft for 140 bhp in the BMW 3.2 Super sedan. U.S. importer Max Hoddman was pressing for something flashier to sell in America and persuaded designer Albrech Goertz to come up with the 503 coupe and convertible and the 507 two-seater sports car – both using the 502 Super’s drivetrain. While these two near-supercars received mild applause, the cost of building both was even worse than the big sedan. Only 413 503 coupes and cabriolets were built between 1956-59 and even fewer 507 two-seaters. For the last two years that the 502s were built, they were marketed as 2600 models in an effort to conceal the age of the design. When the 500 Series was wound up in 1963, to make way for the ground-breaking “Neue Klasse” 1500 sedans, it was found that the 23,400 cars sold actually cost the company $19 million – an average loss of $812 on each one. Fortunately for BMW, between 1955-62 they had also sold 161,728 Isettas, plus another 41,000 under license in other countries. The little bubble car really had saved the company, and the Neue Klasse would see them into the future. Today, though, the grand cars of the 1950s are fascinating pieces of BMW history and desirable collector cars.